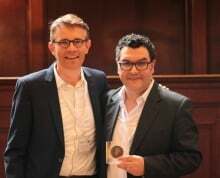 The Portuguese neuroscientist Rui Costa, principal investigator at the Champalimaud Centre for the Unknown, in Lisbon, Portugal, and Professor of Neuroscience at Columbia University, in New York, is the recipient of the 22nd Ariëns Kappers Medal. He was presented with the medal by Pieter Roelfsema, director of the Netherlands Institute for Neuroscience. Costa receives the medal for his seminal work on movement control. In particular, he uncovered critical mechanisms in the basal ganglia that are responsible for controlling the initiation and sequence of self-paced movements. More specifically, he established that the organization of actions into sequences is accompanied by the emergence of sequence-related start/stop activity in basal ganglia circuits. His fundamental research provides a basis for the development of novel strategies to treat disorders such as Parkinson’s disease, autism spectrum disorders, and obsessive-compulsive conditions. The award is named after Cornelius Ubbo Ariëns Kappers, who, in 1908, became the first Director of the Netherlands Central Institute for Brain Research, which is now the Netherlands Institute for Neuroscience of the Royal Netherlands Academy of Arts & Sciences. The award is given to scientists who have made an outstanding contribution to neuroscience. Ariëns Kappers focused his research on comparative neuro-anatomy and was well known for his travels all over the world to collect his samples. His best known publication is “Die vergleichende Anatomie des Nervensystems der Wirbeltiere und des Menschen“, published in English in 1936 as “The Comparative Anatomy of the Nervous System of Vertebrates Including Man”.